Jubilee, the Goethe-Institut Brussels and Argos welcome the Berlin-based film curator Florian Wüst for a research residency. He will work on his project Speculation and Economy: Life in Finance Capitalism. More specific, will he explore the archives from a.o. the Cinematek en Amsab in search of cinematic traces, that shed a light the construction of the ‘European project’ from the early 50’s on. In 2013, the Goethe-Institut invited independent film curator Florian Wüst to develop a film series, entitled Speculation and Economy: Life in Finance Capitalism. He developed a programme, that looked at the people and stories behind the facades of capitalism. Its transactions – supposedly abstract, predictable and self-regulating – are, in their dependence on psychology and imagination, a game of money and power causing real effects, that is to say, personal and social. Video works screened were for example Harun Farocki’s Nothing Ventured (2004), Jan Peter Hammer’s The Anarchist Banker (2010), Christian Petzold’s Yella (2007) and The City Below (2010) by Christoph Hochhäusler. Building upon this programme, Florian aims to extend the project to other locations, specifically Brussels and other cities in the Benelux and the EU. 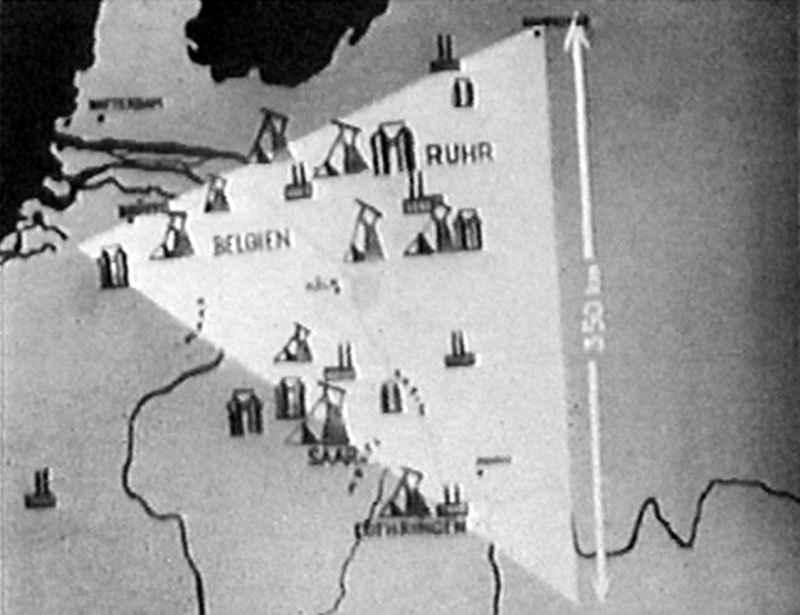 Scheduled for September/October 2015, the project will be adapted to local issues and focus specifically on the early days of the European Union, the Benelux and the (re)construction of Europe after 1945. Promotional films and other short and long video works will comprise the programme, as well as talks, discussions and a printed catalogue. In the article Advertising Europe Through Film, published in Europe (to the power of) n (2013), Florian notes that the idea of a united Europe has never been so tangible, so real as today. European Union member states are linked through various supranational institutions in addition to a shared market. Yet, critical attitudes towards the European Union and agitation keep rising. Furthermore, campaigns like I want Europe (2012) or the European Commission's video series promoting EU enlargement show that the idea of a united Europe doesn't just sell by itself. This was in fact never the case, Florian argues. In the early 1950s, at the very beginning of the (West) European integration process, great efforts were made to propagate the ‘European project’ as a means to economically reconstruct and modernise the war-devastated continent. Early European promotional films and other relevant works will be part of ‘Speculation and Economy’. Florian Wüst is an artist and independent film curator based in Berlin. Besides curating film programs for international venues, Wüst frequently writes and lectures about topics related to film and society. Together with Stefanie Schulte Strathaus, he is editor of Who says concrete doesn’t run, have you tried? West Berlin Films in the ‘80s, (2008).